And decided to stick to something I love and which has served me well in the past: sponge roll. 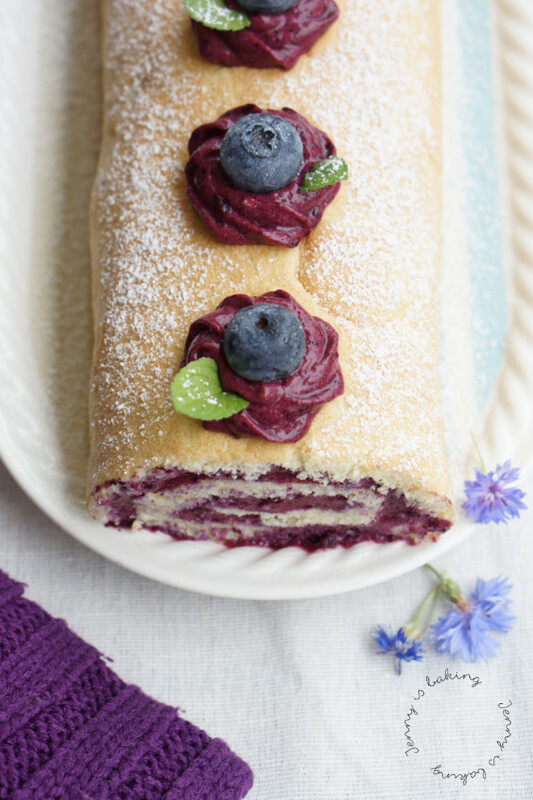 Sponge roll with an ultra creamy, yet refreshing filling. So I decided blueberries would serve me well. Yes, you have to turn on the oven, but it is for a mere ten minutes and this cake really doesn’t take that much time to prepare anyway. Trust me. Are you afraid of sponge cake? Don’t be. The most important point is to get the eggs to room temperature. If you forgot to take them out on time, place them in a bowl with warm water for about five minutes. While you wait, prepare your bowls. Pay special attention to the one you wish to use for whipping the egg whites, it has to be completely free of grease. I also recommend weighing all ingredients before you get started because one of the most important aspects of sponge cake to taste like a feather is to very gently fold in the egg yolk mix with the meringue and immediately bake that roll. Don’t let it sit for too long, so make sure to preheat your oven. I love sponge rolls, they are so easy to prepare yet somehow I feel they were forgotten. They don’t seem to be that popular anymore. What a shame. You don’t need to spend hours and hours in the kitchen if you have company coming over, I love the fact that you can prepare the sponge roll in advance, read my notes below. Gently pour the egg whites on top of the mixed egg yolks and sift the flour and cornstarch on top. Don't skip this step. It is important that the flour mix was sifted. Gently mix all ingredients with a wooden spoon. Try to incorperate the flour mix and egg whites without losing volume. Don't overmix. Using a spoon, put batter on the prepared baking sheet and immediately bake. Don't let the batter sit for too long as it will quickly lose volume. Pour on prepared baking sheet and bake for 8-10 minutes. The top should look golden brown. Watch the oven carefully, it happens rather quickly. Meanwhile take a tea towel and spray with water or put in water and wring it out and put on clean surface. Once you take the sponge cake out of the oven, transfer to the towel (parchment side paper up) and take off the parchment paper (see visual). Roll up with the towel inside (see visual above) and let cool off. Don't wait too long until you roll it up, otherwise you will get cracks. For the blueberry filling put blueberries and 120 milliliters of milk in a pot on the stove and bring to boil. As soon as blueberries are soft, take out and blend (e.g. food processor or even with a fork). Put instant vanilla pudding, two tablespoons of white sugar and 50 milliliters of milk in a mug and stir until you see no lumps. Bring pureed strawberries and milk to boil again and add the vanilla pudding mix. Stir constantly and bring to boil for at least two minutes until it thickens. Transfer mixture to the fridge and let cool off for at least 10 minutes. Meanwhile cream butter, cream cheese and 30 grams of sugar in a bowl with a mixture. Slowly add the cooled-off blueberry mix by the spoonful until you have a nicely colored cream. Put in the fridge for a little, covered in plastic wrap. 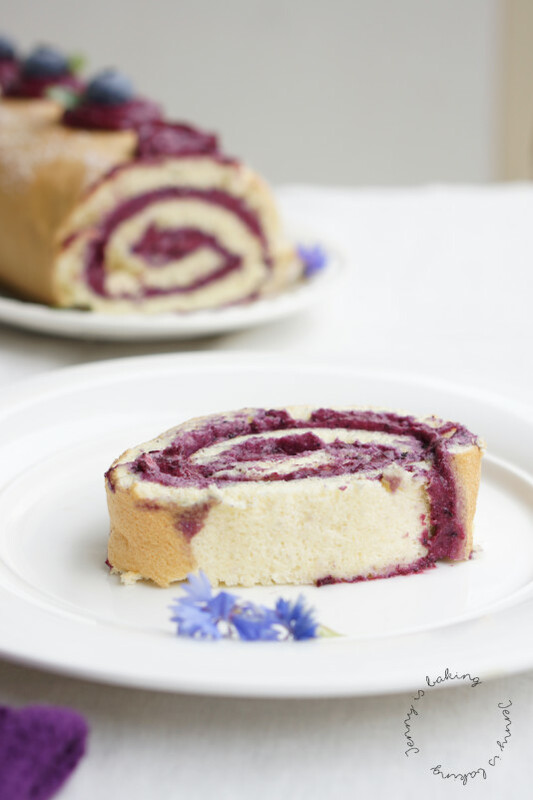 To assemble the roll first take the towel out of the sponge cake and fill generously with blueberry cream. Leave at least one centimeter around the edges, otherwise your cream will get out. Roll up and pipe about five roses on top. Place one blueberry into each rose and decorate with mint leaves to your liking. 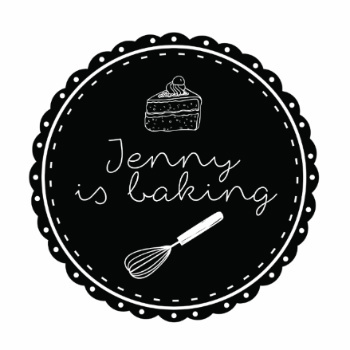 If desired, sprinkle with icing sugar. The sponge roll can be frozen. Prepare the roll, roll it up and cover with plastic wrap. Keeps in the freezer beautifully. 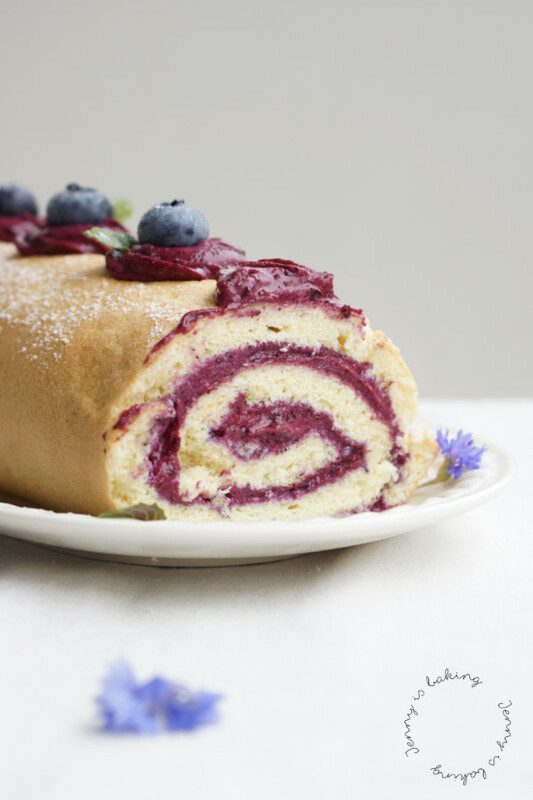 You can also prepare the blueberry cream a day in advance. However, make sure you place it in an airtight container as it otherwise dries up. Let sit for a little while at room temperature if you want to pipe anything. Since it contains butter, it will get harder in the fridge. Obviously you can fill the roll with anything you like. I have seen some with lemon curd/whipping cream, raspberries, any other fruit you like, mascarpone, etc., ect. For any version it is best to eat the sponge roll within a few days after full preparation. Keep with plastic wrap in the fridge overnight. 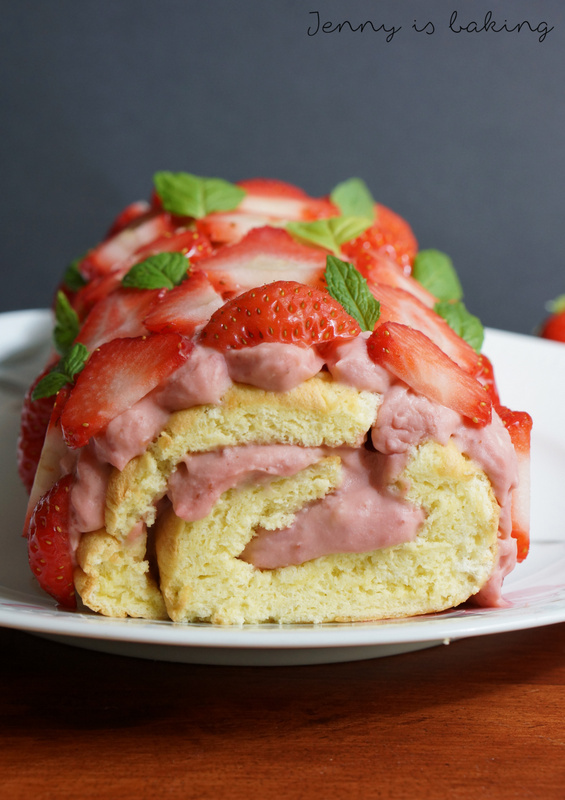 In case you would rather go with another flavor, I have a strawberry sponge roll recipe to be found here. I have also successfully made the cream with raspberries, blackberries, pears, and mango. Frozen fruits work just as fine, go wild with your favorite fruit! 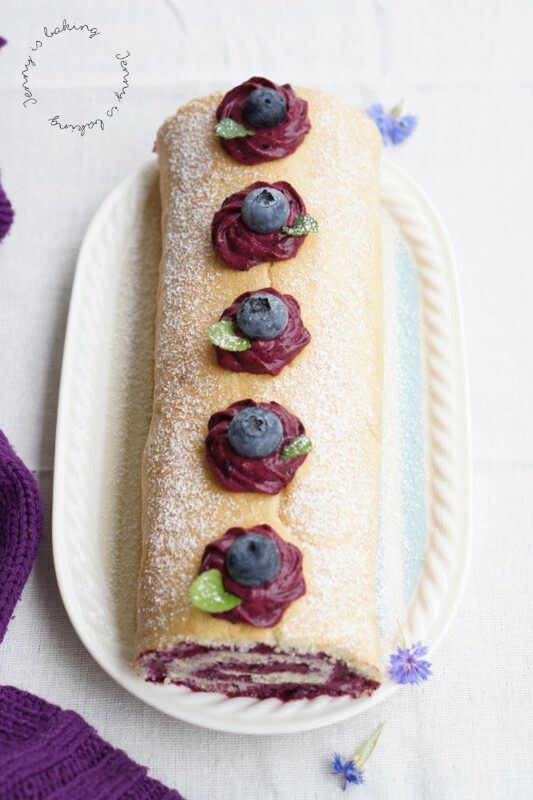 So what would be your favorite fruit for this sponge roll?